Windows operating systems have evolved greatly from the time where hard drives were segmented off using a simple fdisk DOS command. Beginning with exFat FAT32 and NTFS systems complex partitioning was created so as to allow specialized applications to run. This process improved further with the advent of the NTFS file system. Of course as things evolve they become more sophisticated and this often means that they are more prone to problems. In the case of windows partitions they can be lost, overwritten or simply damaged by a virus. Once this happens it can result in a semi-catastrophic failure. These problems create a genuine need for a quality program for data recovery. 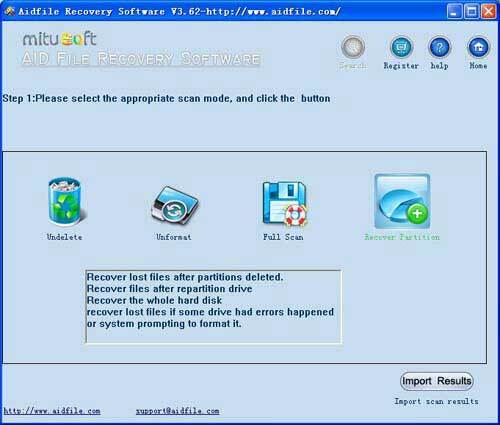 Aidfile Recovery Software is just such a program. This simple to use yet extremely powerful advanced lost partition recovery software has two modes to scan and locate lost / missing partitions. When you could not see one of your partitions that means might be corrupted or lost, and of course, the data store on them cannot be accessible too. The partition lost may happened after operating system reinstallation, accidentally deletion, incorrect manipulation, virus infection. Partition lost most because of partition table corruption. Partition Table is a kind of system file which contains critical information about the hard drive partitions, including the start point and end point of an external hard drive partition, file system, name, size and other important information of an external hard drive partition. Select the "Recover Partition " button and select the hard drive, then click the "NEXT" button.